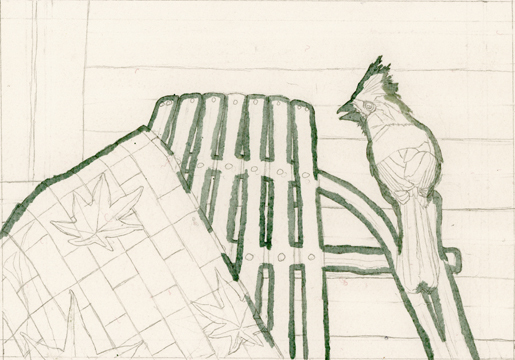 Here is a work in progress of a northern cardinal perched on a rocking chair that is draped with a quilt someone temporarily left there. Perhaps this person has gone inside to refresh a cup of coffee, and in their absence, a cardinal has flown down to take a closer look. I’ve got a series of these images I’m working on, each with a different quilt pattern representing the four seasons. I thought this painting would be a good one to share with you this week. This entry was posted in Works In Progress and tagged bird art, Bryan Memorial Gallery, Franconia Notch, NH Artist, northern cardinal art, songbirds, vermont artist, vermont watercolor society, watercolor art, white mountain artist, WREN gallery. Bookmark the permalink.